Airlift 13th Day Collection – Akshay Kumar’s ‘Airlift’ slowed down after a superb second weekend, collected 2.4 crores on the 13th day. After a superb second weekend with the collection 19.26 crores, Akshay Kumar’s ‘Airlift’ witnessed a significant drop at the Box Office on weekdays. After a superb 2nd Sunday with the collection of 8.26 crores, the movie saw a big drop on Monday and managed to collect only 2.53 crores. As per the official report by trade analyst Taran Adarsh, Airlift 13th day collection is 2.4 crores. The movie now stands at the total collection of 110.3 crores bu the end of 13 days. With the total collection of 110.3 crores, ‘Airlift‘ is the fourth highest grosser of Akshay Kumar after Rowdy Rathore, Holiday and Housefull 2. 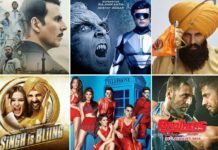 ‘Airlift’ will beat the lifetime collection of Holiday (113 crores) but the lifetime collection of Rowdy Rathore (Akshay Kumar’s highest grosser) is looking out of reach as the movie has slowed down in last few days. With the release of ‘Ghayal Once Again’ and ‘Sanam Teri Kasam’ this week, there will be a big drop in the screen count of ‘Airlift‘. As per my prediction, the movie will end up its Box Office journey with the lifetime collection of around 125 crores.